If you're gift hunting and thinking, "Help me, Obi Wan Kenobi!" then this guide is for you. The latest addition to the iconic Star Wars saga, "The Force Awakens," which is in theaters on Dec. 18, has old and new fans rushing to stores for the latest movie-themed gear. Here are some of the coolest Star Wars things your money can buy this holiday season. Repair your toaster or amp up dull arts and crafts with this nifty duct tape. With your favorite Jedi, Yoda, this tape is complete; $8. More information: shurtechstore.com. Find the best price: shopping.google.com. Where would Han Solo be without Chewy? Become one of the greatest leaders of the rebel alliance like Solo with your own Wookie companion; $20. More information: toysrus.com. Find the best price: shopping.google.com. Bring the force into your kitchen with this R2-D2 measuring cup set. Complete with a base, your favorite droid dissembles and reassembles into four measuring cups and four measuring spoons from a quarter teaspoon to one cup; $19.99. More information: thinkgeek.com. Find the best price: shopping.google.com. He was a real bad guy, but good cooks will get a kick out of this Darth Vader apron; $20; More information: housewared.com. Find the best price: google.shopping.com. Dress better than Queen Amidala in these super cute tees; $50 - $72; More information: junkfoodclothing.com. Find the best price: google.shopping.com. Channel the dark side of the force with Darth Vader stainless steel studs; $14.22. More information: amazon.com. Find the best price: shopping.google.com. The best part of waking up, is the Death Star in your cup! Put the matcha down and steep your favorite (or darkest) tea. Don't worry -- Darth Sidious approves; $20. thinkgeek.com. Find the best price: shopping.google.com. Your cutest companion is here! The latest Furby creation takes the form of the world's most beloved wookiee complete with Chewbacca-like sounds. Download the companion app to play games and virtually collect "Star Wars Furby Furblings." $80; More information: hasbro.com. Find the best price: google.shopping.com. Come clean with your favorite Sith lord using this Oxygenics "Star Wars" Darth Vader Handheld Shower Head with three spray settings; $32.95. More information: oxygenics.com. Find the best price: google.shopping.com. Wake up (or hit snooze!) to the coolest eight-inch soldier of the Galactic empire with this digital, lighted alarm clock; $23. More information: lego.com. Find the best price: shopping.google.com. Just can't get enough of Darth Vader's breathing? Well now you can hear it wherever you go! This keychain plays classic sounds from the saga like Princess Leia's plea, "Help me, Obi Wan Kenobi. You're my only hope." $9. More information: amazon.com. Find the best price: shopping.google.com. What's the best thing since sliced bread? Toasting imprints on your sliced bread! 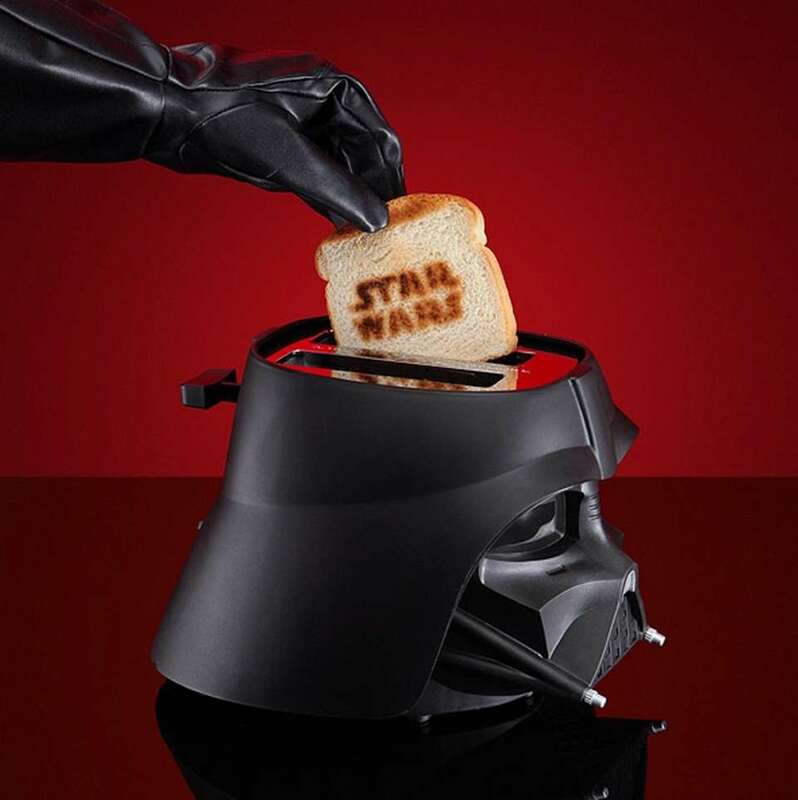 Get geeky with this compact two-slice toaster that resembles Darth Vader's mask; $50. More information: thinkgeek.com. Find the best price: shopping.google.com.